Francis Hopkinson Smith was born in Baltimore, Maryland, the descendant of a signer of the Declaration of Independence and of the first President of the Pennsylvania Academy of the Fine Arts. He had a successful career as a naval engineer, working on such projects as the Statue of Liberty and the Race Rock Lighthouse off Block Island. By the 1880s, Smith gave up engineering to pursue art and writing among other pursuits. 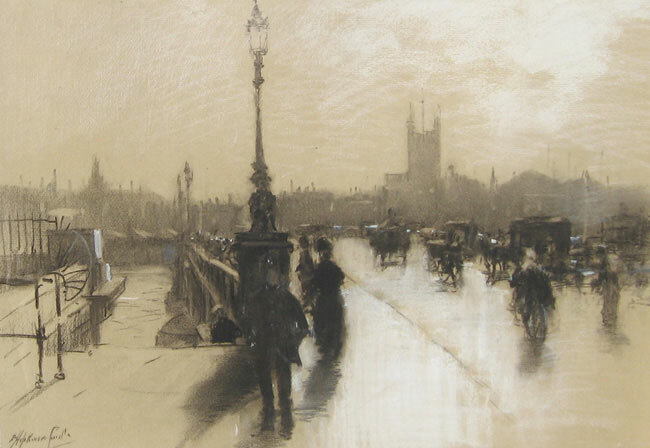 Smith was self-taught and quickly achieved great skill in pastel, charcoal and oils. He spent part of each summer in Venice, and also traveled and painted throughout Italy and in Mexico, Spain, Turkey, and France. Smith was a member of several art associations including the American Water Color Society where he was the treasurer from 1873 to 1878, the Art Clubs of both Philadelphia and Cincinnati, the Society of Illustrators, the Tile Club and the Century Association. He exhibited award-winning works at the Philadelphia Art Club, the American Art Society, the Buffalo and Charleston Expositions of 1901 and 1902, and many others. In addition to painting, Smith was a prolific and successful writer, illustrating many of his own books and was a member of the American Academy of Arts and Letters. A few of the titles of his books, both fiction and non-fiction, are Colonel Carter of Cartersville (1891), Gondola Days (1897), The Fortunes of Oliver Horn (1902), and In Dickens’s London (1914). Please contact us if you are interested in selling your Francis Hopkinson Smith paintings or other artwork from the 19th century and early 20th century.